What to Expect in Thyroid Surgery? The thyroid is a gland within the endocrine system responsible for secreting hormones into the bloodstream, which work to control how the body uses food for energy. The butterfly-shaped gland is located in the front of the neck and has a major influence on how well the organs are working throughout the body. 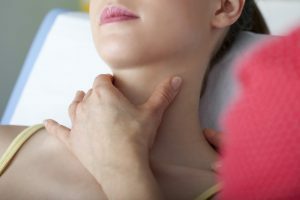 When the thyroid is not working properly, too much or too little of the hormone is typically released, leading to a number of associated symptoms. The most common issues related to the thyroid include an overactive gland, underactive gland, formation of a lump, or an enlarged gland. Although surgery is not always necessary to treat the thyroid, a resection may be required to effectively improve the gland’s function. At Suburban Surgical Care Specialists/Kane Center, our experienced doctors perform thyroid surgery most commonly to remove nodules or other abnormalities. Although growths on the thyroid are often benign, they can still affect the balance of hormone secretion. Our surgeons often recommend the removal of these nodules to ensure the thyroid maintains its proper function. If a nodule proves to be malignant, further testing of the area may be necessary to determine if the cancerous cells have spread. Thyroid surgery involves the use of general anesthesia to ensure the patient remains completely relaxed and comfortable. A very small incision is created at the front of the neck near the thyroid, through which one of our surgeons will operate to carefully remove the nodule using advanced radio-guided imaging technology. More specific details of what a patient can expect during their procedure is discussed during an appointment with their doctor.